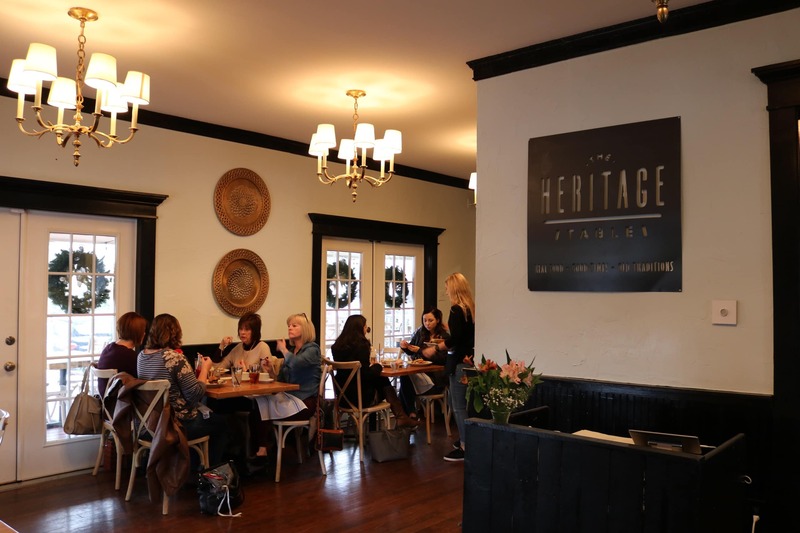 Last summer, The Heritage Table opened in a 1917 converted Victorian home on Main Street, and the crowds haven’t stopped since. Owner Rich Vana, who previously produced the informative Entree Dallas blog, launched a catering company in late 2014 called Heritage Table. As the business grew, he knew he wanted to open a full restaurant, and began his search for a location. Vana found the 100-year-old home in historic downtown Frisco to be perfectly suited for his “scratch kitchen” concept. Not only does this popular eatery offer an impressive menu, one featuring great touches like homemade bread, house-cured and smoked meats, locally-sourced produce and craft beverages, but it also has a vibe that is warm and welcoming to all who enter. The atmosphere capitalizes on the character of the old home combined with farmhouse touches and modern accents creating a casual & fun ambiance. Choose a spot in their spacious dining room or if the weather is amenable, which it is for much of the year, stake out a spot on their large, wrap around patio. Or if trying one of their craft beverages is on your itinerary, saddle up to the bar right as you enter the front door and find something to wet your whistle. Heritage Table currently serves lunch and dinner during the week and brunch on the weekends. 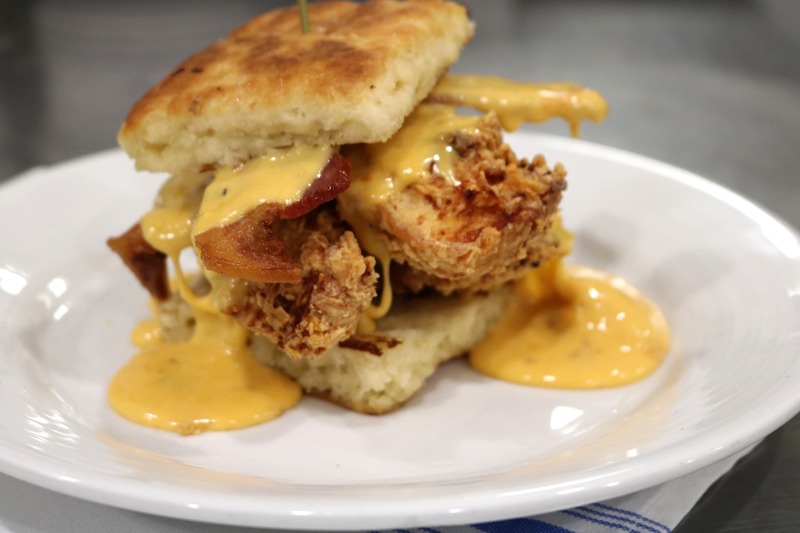 Among their delicious offerings for weekend brunch are eggs benedict, chicken and waffles, buttermilk pancakes, biscuits and gravy, steak and eggs, omelets and French toast. During the week, Heritage Table only serves lunch and dinner and knocks both meals completely out of the park. On my first visit there last summer, I tried their house-made pastrami sandwich, which is unfortunately no longer on the menu, recently replaced by a cheesesteak, which I still need to try. That pastrami was the best I’ve ever had. Not only was it plentiful and literally overflowing off the sandwich, which was topped with swiss cheese. And the side of macaroni and cheese was among the best I’ve ever tasted and that is one comfort food I’ve eaten my share of in life. Not only was their mac and cheese both creamy and flavorful with a nice mix of cheeses (sharp cheddar and smoked provolone) and bread crumbs on top to give it a bit of added texture, but it was filling and delivered that feeling which only great comfort food is known for. Something else I remember about my first visit is barely being able to get past the starters section on the menu, where appetizers like their Trio of Dips, Squash Fritters, Cheese Fries, Spicy Lamb Meatballs, Deviled Eggs and Crab Cakes each share equal billing as headliners. I nearly ordered their crab cakes, one of my all-time favorite dishes, but instead went the sandwich route. I didn’t regret my decision. On my second visit, I decided to try their BLT, which features house-made bacon, heirloom tomatoes, fresh lettuce and a house-made aioli, all on house-made sourdough. I’ve eaten many a BLT in my life and let me say this was the best I’ve ever had hands-down. The house-made bacon was incredibly delicious, crunchy and also plentiful. The heirloom tomatoes and fresh lettuce were equally stellar while the homemade sourdough brought the entire sandwich together nicely. But, I didn’t stop there. I also had a cup of their chicken and noodle soup, also homemade, and another side of their great mac and cheese. The soup had plenty of chicken and elbow macaroni for noodles along with fresh herbs and onions. Much like the BLT, this chicken noodle ranks in the pantheon of great soups I’ve ever eaten, and that’s a sizeable amount of soup. Heritage Table also has a leek and potato soup, which I have yet to try. But if this offering is half as delicious as their chicken noodle, then sign me up. Of course, Heritage Table has plenty more to choose from on its lunch menu, including fish tacos, a burger, a Cuban sandwich, and a smoked turkey and avocado sandwich. Those craving a baked potato are in luck as they can order one fully loaded or maybe a sweet potato is more your taste, which they also offer. Heritage Table also offers salads, including the usual suspects like Cobb, Caesar and even a Mimosa salad which is on their brunch menu and fittingly comes with a champagne vinaigrette. As for dinner, there are plenty more delicious offerings like chicken pot pie, roasted chicken, spaghetti and meatballs, homemade meatloaf, grilled salmon, a grilled pork chop and steak frites. And if you’re not thoroughly stuffed after a great meal at Heritage Table and still have room for dessert, they have several great ways to cap your meal like cheesecake, an ice cream sundae, chocolate cake and fried pies. Simply put, The Heritage Table is a great local eatery with a wide-ranging menu offering something for all tastes. About their only drawback is they’re closed on Mondays, but…I suppose everyone deserves a day off.